Prominent & Leading Manufacturer from Nagpur, we offer pineapple soan papdi. We are one of the leading organizations, engaged in manufacturing and supplying Pineapple Soan Papdi. Available in different size of packs, our soan papdi is prepared under clean and hygienic environment conditions, using quality ingredients. Furthermore, we make use of premium-packaging material to pack these products, before delivery. 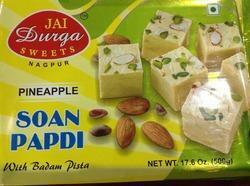 Looking for Pineapple Soan Papdi ?